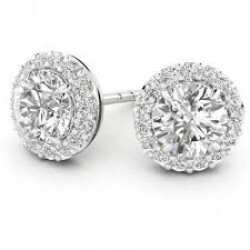 Look and feel amazing in a pair of our sensationally earrings, from solitaire, princess cut, oval, pear, and cluster style earrings, with a large collection on offer from the most famous designers in the world, from Cartier, Tiffany, Bvlgari, Boodles, Chopard and many more, a stunning collection of perfectly matched earrings. Explore our collection and indulge yourself. Please browse online today. Wonderful 18ct yellow gold earrings, featuring 6 round, brilliant cut diamonds, and a border of clus..
MINT CONDITION 18CT WHITE GOLD CARTIER DIAMOND LOVE SCREW EARRINGS. Both earring have a stunning qua.. Excellent condition 18ct white gold head with 3 round, brilliant cut diamonds, and a border of clust..
MINT CONDITION CHOPARD 18CT WHITE GOLD HAPPY DIAMONDS STUD EARRINGS, STUNNING!!! set with a total of.. SUPERB CONDITION 18CT YELLOW GOLD DIAMOND DROP CHOPARD EARRINGS. UK purchased with Chopard INNER AND.. Wonderful 18ct white gold Chopard earrings, featuring 2 round, brilliant cut diamonds. The earrings .. SUPERB CONDITION 18CT YELLOW GOLD DIAMOND DROP CHOPARD EARRINGS. UK purchased with Chopard box and p..
AS NEW 18CT WHITE GOLD SIGNED THEO FENNELL 1.04CT PRINCESS CUT DIAMOND EARRINGS. UK BOX & CERTIF..